@RWhittall @JamesTylerESPN @mixedknuts @JamesWGrayson Have Liverpool overperformed by more than the typical champion? That's harder to say. I think that the first part of this is intuitive. There’s a group of good teams at the top of the table, some will under-perform and others over-perform in a given season, then the team that over-performs is more likely to win. The second part is interesting question and worth a look. I’ve previously showed that as a basic metric total shots are the best indicator of future performance, and thus of team skill. I’ve also shown that both a teams PDO, and the percentage of the shots it takes and concedes that go on target are both largely luck driven, even over the course of a season (links for PDO and %TSoT). This season LFC have had a good but not spectacular TSR, a ridiculously high %SoT number, and an above average PDO. (I’ve also included MCFC in this post as they could realistically still win the title. For the record, their TSR is high, their %SoT is average, and their PDO is high). First I’ve used historical regression of the three metrics and combined them to give each team in the past 13 Premiership seasons a rating (n = 260 team seasons). This metric has an R-squared to points scored over a season of 0.80, which is pretty good for a metric that doesn’t include goals (for reference – the R-squared between goals and points is ~0.93, whilst the R-squared between points and TSR is ~0.65). Then, I determined the value of this metric for each of the previous Premiership champions to see how many points we’d have expected them to score based on their performance. 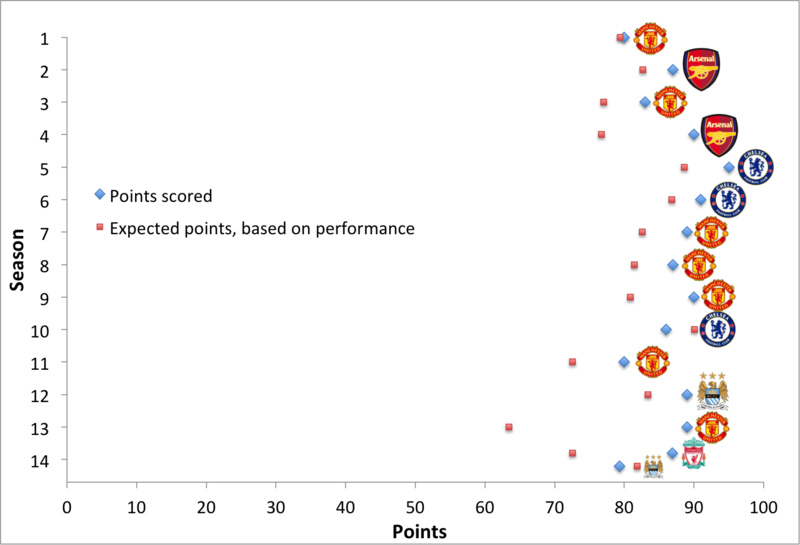 This is shown in the plot below (for ’13-14 LFC and MCFC I’ve pro-rated their points per game over the course of a full season). One, Caley’s point appears to be true – as 12 of the previous 13 Premiership champions have scored more points than expected, and the Champions score, on average, ~7 points more than they’re expected to by this metric based on their performance. Two, United last season are simply incredible. They scored 25.5 points more than expected based on their performance. I doubt stats will ever be able to explain that season. Three, the Chelsea team of ’09-10 (not ’08-09 as earlier written – thanks Salim Makda) was incredible. Seriously good. By this measure they were a true talent 90 point team. The two Chelsea championship teams under Mourinho come in as true talent 89 and 86 point teams, which is also incredible. Finally, by this measure, LFC are on pace to finish the season with the second largest over-performance by a Premiership champion, whilst MCFC would be counting themselves unlucky for the second season in a row.